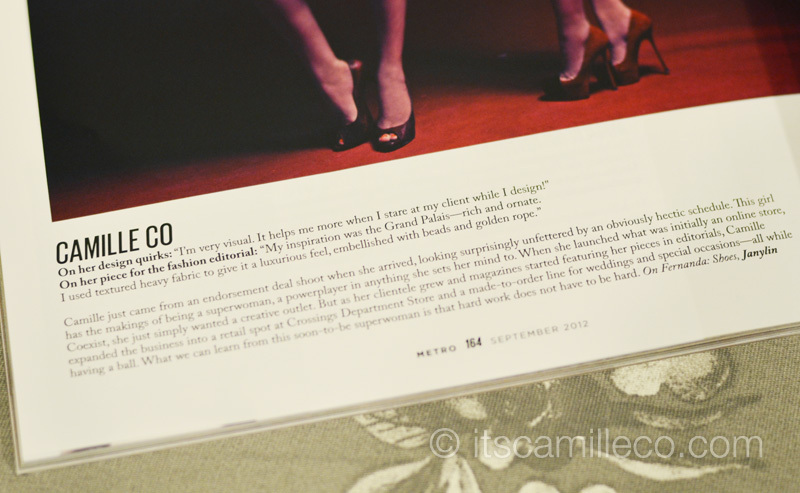 Here I am, this time featured as one of the 12 young fashion designers for Metro Magazine’s fashion issue. We were all asked to create something in red. I was actually busy with clients’ orders during this time so I couldn’t find the time to make a new dress for this spread. Good thing I had an existing design from last year that fit the theme and model rocked it. I really get a different high whenever I get featured as a designer. It’s always a huge honor for me, more than getting acknowledged as a fashion blogger and everything else. Fashion design is and will always be my first love, my priority and my path. 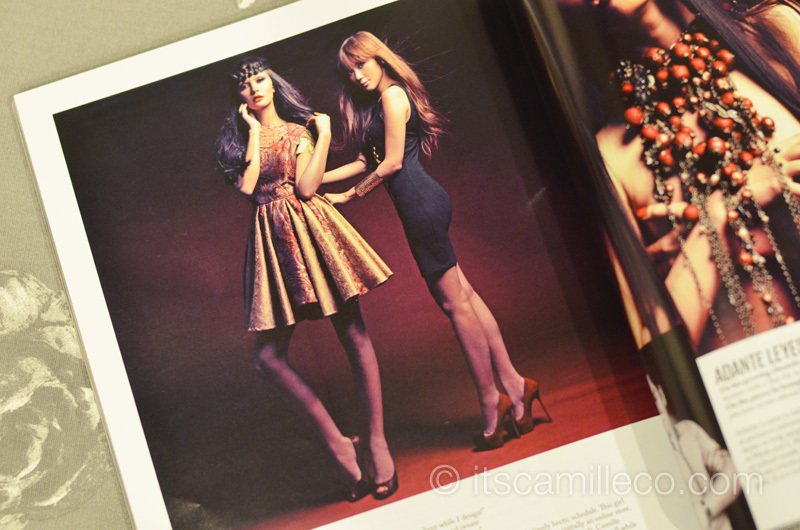 Another short feature as a fashion blogger on Megaworld Lifestyle Malls Magazine. I basically just modeled har har. Margaux Romero styled me for this shoot. 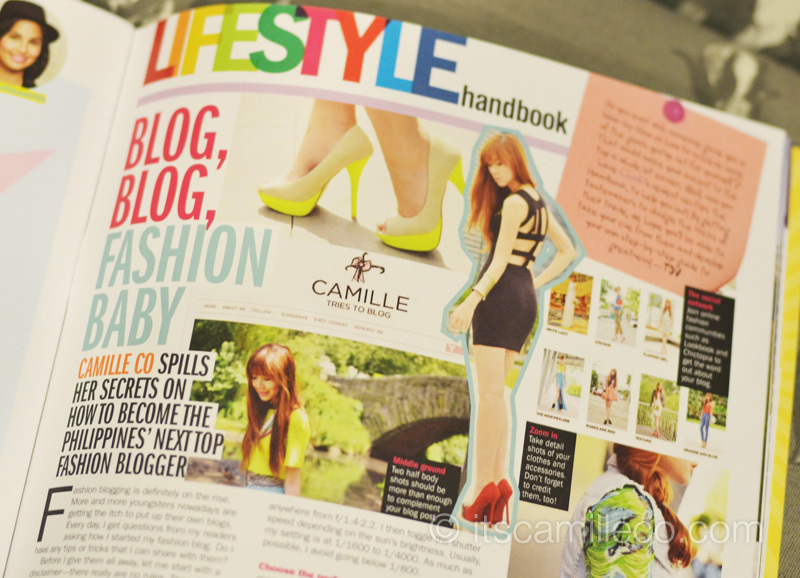 Chalk Magazine asked me to write a how-to article on being a style blogger for their September issue. If you were able to get a copy, I hope you liked it! 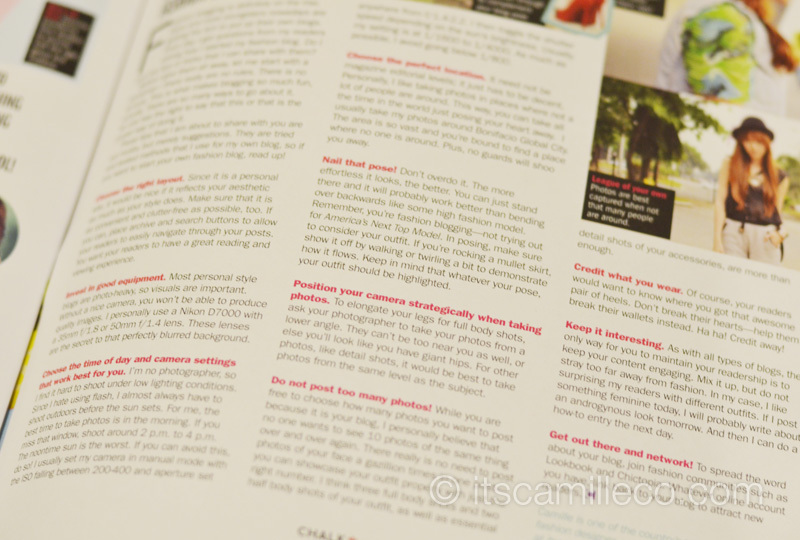 I shared a lot of my style blogging tips, everything from how to pose to how many photos to post to my camera settings. Of course, like what I wrote in the article, these are not “MUSTS” but merely suggestions that work best for me. 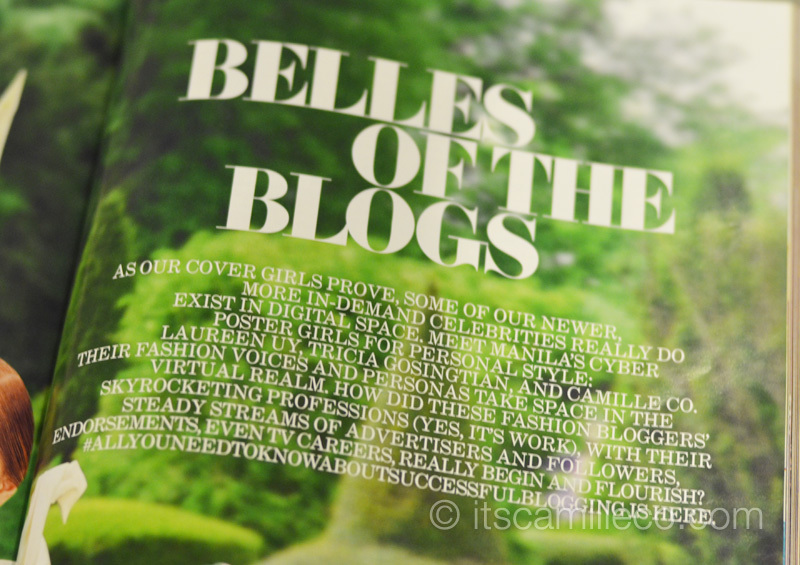 I actually have another article coming out this November on Meg Magazine. I hope you guys can grab a copy of that as well. Sorry, I just had to plug haha! hello! 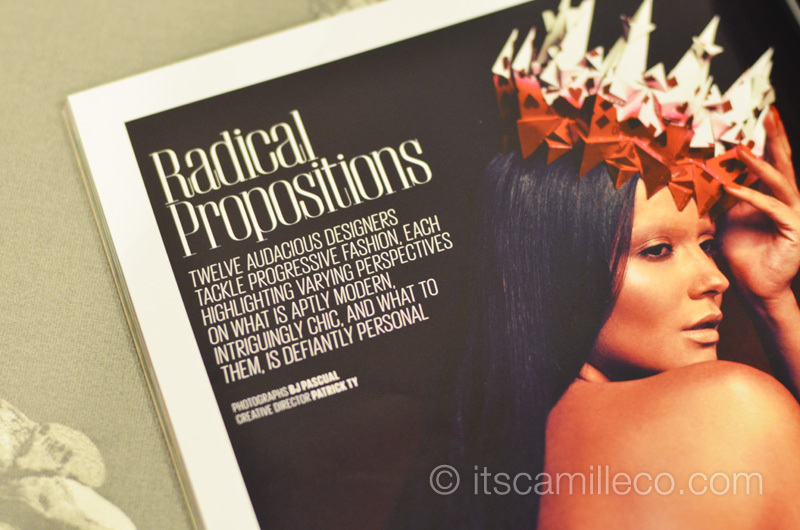 Hi model/blogger/article writer! haha I am so happy for you! For your success, fame and intelect. I would just want to know what type of laser hair removal you have done on your ? Underarm! hehe so embarassing to ask, I am sorry. Miss Cams, sinuyod ko buong NBS at anu-anong lugar na pero mukhang marami na ang nakauna sa akin!!! What? Why? Haha! Thanks Molly! You really looked cute! when you make “kindat” ! Hahaha! I didn’t think so but thanks Mercy! Camille, you rock! You’re on ETC! OYEAH! Haha thanks Frances! :) Sweet! The photo spreads in these magazines look great! 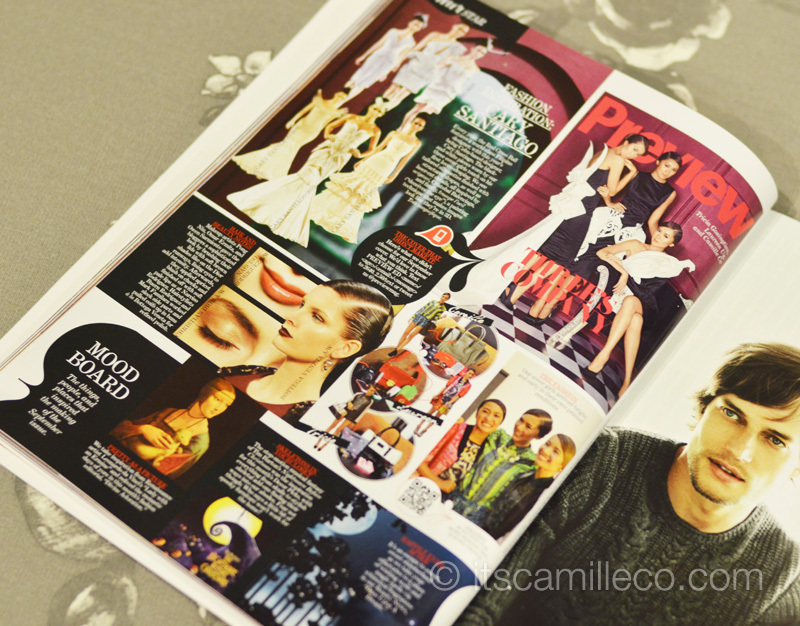 I love the shoots in Metro and Preview magazine! Congratulations on all your success! Hahaha Thanks Danielle! You just had to! I’ve witnessed your transformation in fashion from the first time you started blogging up until now, I can tell that you deserve all of these blessings..your hard works totally paid off.. Thank you Jud! :) That would be awesome! Awww I have no Halloween costume around! 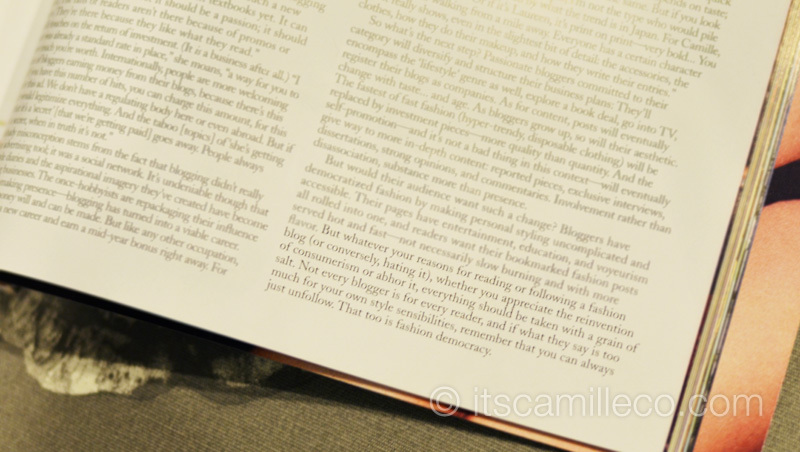 Dear Camille, where can international readers find your preview article? because of your guesting on Etcetera I discover your blog. And since then, I always here at hanggang ngayon..
Yay! Happy anniversary! :) Thank you Emmrose! Awwww, I can’t take na you hate me, I was not able to buy Preview Sept. ish kasi. Wala akong pera, TSK. But I am really going to buy!!!!! Hahaha I know it will really really be beautiful. Eh kayo ba naman ni ate Lau at Tricia eh. BTW may I ask how you maintain your accessories. I know you have a lot and keeping them good may not be easy. And some of the gold toned bangles sometimes fade. What do you do to keep them from deteriorating? Thanks! Congrats on the brilliant feature! All of the photos are so colorful and eye-catching. I’d really love to read the interview though! Hahaha o sige, ikaw na! :) Thanks Reena! Thanks Carina! :) I checked it out! You have a pretty smile! Taas ng dreams natin! Haha! :) Thanks CC! I guess not only me. You are doing so well for yourself big up, all the best with your future endeavors sweets.